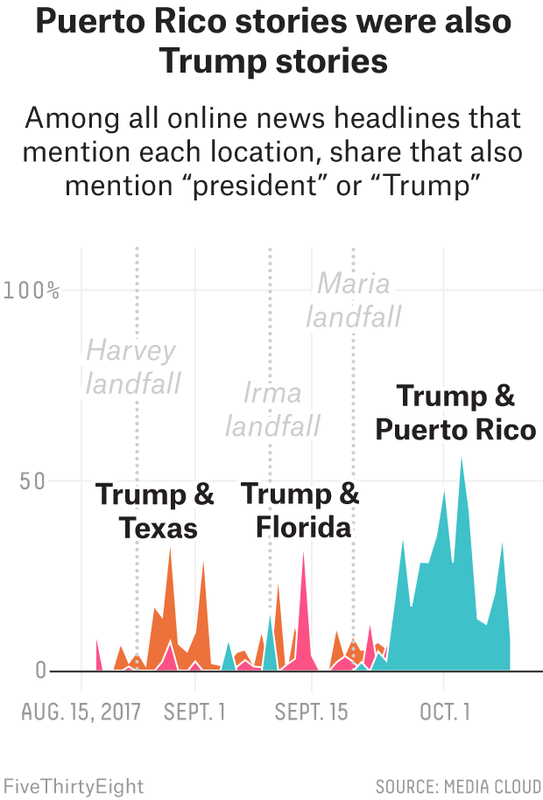 In the two weeks following the hurricane, an average of about a quarter of online news headlines in our data set that mentioned Puerto Rico also mentioned Trump. About 10 percent of Texas headlines also mentioned Trump in the immediate aftermath of Hurricane Harvey, and only about 5 percent of headlines about Florida also mentioned Trump in the two weeks after Hurricane Irma. When President Trump visited the island last week, just over half of the headlines that mentioned the territory that day also mentioned Trump, a far higher proportion than we saw when Trump visited Texas and Florida. Not all of that coverage was positive. Some was criticism of the president’s statements and behavior, and some highlighted criticism of the federal response for being too slow. Several recent polls show that people disapprove of the way the administration has handled the Puerto Rico crisis and the president’s approval rating had been ticking downward since the hurricane struck, though that could be influenced by other events as well. Puerto Rico’s recovery will continue to merit media attention for many months. News organizations will have to keep making decisions about how much of that coverage should be dedicated to President Trump and how much should be devoted to the people of Puerto Rico. We looked at sentences spoken on cable TV and written in online news sources from Aug. 20 through Oct. 10, 2017. TV news data was collected using the Television Explorer tool, which produces analysis by the GDELT Project using closed captioning data from the Internet Archive Television News Archive. Online news was collected using Media Cloud, a database that collects news that is published on the internet each day. Specifically, we used their “U.S. Top Online News” collection, which looks at 48 top online news sources as of 2015 according to Pew/Comscore. Shoutout to one of our readers who also noticed this change. An analysis from Vox shows an even starker difference in Fox’s coverage. Our analysis, which is based on the number of sentences that mention Puerto Rico rather than the time spent on the topic, shows a similar trend.